Electron tomography is currently a versatile tool to investigate the connection between the structure and properties of nanomaterials. However, a quantitative interpretation of electron tomography results is still far from straightforward. Especially accurate quantification of pore-space is hampered by artifacts introduced in all steps of the processing chain, i.e., acquisition, reconstruction, segmentation and quantification. Furthermore, most common approaches require subjective manual user input. In this paper, the PORES algorithm “POre REconstruction and Segmentation” is introduced; it is a tailor-made, integral approach, for the reconstruction, segmentation, and quantification of porous nanomaterials. The PORES processing chain starts by calculating a reconstruction with a nanoporous-specific reconstruction algorithm: the Simultaneous Update of Pore Pixels by iterative REconstruction and Simple Segmentation algorithm (SUPPRESS). It classifies the interior region to the pores during reconstruction, while reconstructing the remaining region by reducing the error with respect to the acquired electron microscopy data. The SUPPRESS reconstruction can be directly plugged into the remaining processing chain of the PORES algorithm, resulting in accurate individual pore quantification and full sample pore statistics. The proposed approach was extensively validated on both simulated and experimental data, indicating its ability to generate accurate statistics of nanoporous materials. Van Eyndhoven, G, Kurttepeli, M, van Oers, C.J, Cool, P, Bals, S, Batenburg, K.J, & Sijbers, J. (2015). 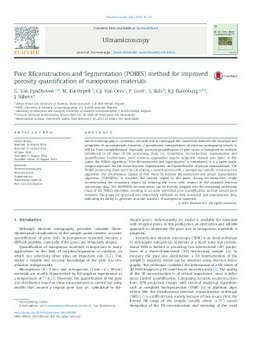 Pore REconstruction and Segmentation (PORES) method for improved porosity quantification of nanoporous materials. Ultramicroscopy, 148, 10–19.